A motorcyclist is in a "stable condition" in hospital after suffering a head injury in a crash with a taxi driver. 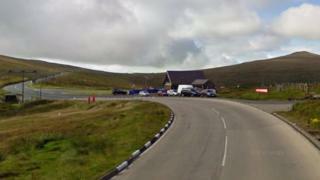 The 50-year-old German rider was injured close to The Bungalow section of the A18 Mountain Road, on the Isle of Man, on Monday. He is being "assessed with further scans" at a UK hospital, police said. The taxi driver was unhurt. The crash was not connected to the 2017 Festival of Motorcycling. The motorcyclist has not been named due to "right to privacy issues", police said. The Mountain Road is two-way to all traffic during the festival unlike the TT where it switches to a one-way system.